The Arts of Africa gallery, opening at LACMA on July 7, will leave no period untouched. Over the next few years, the displays at the 2,500-square-foot space will embrace the very new (a transparent figure fashioned from matchsticks in 2005) and the very old (wooden memory boards bedecked with kaleidoscopic beads dating back to the 18th century). Here’s a preview. 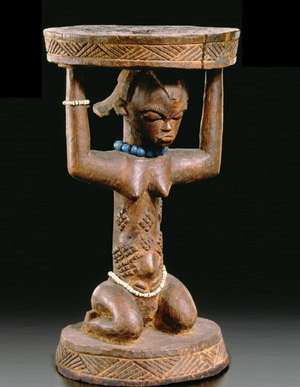 The debut exhibition, Shaping Power: Luba Masterworks, features antique pieces by Congolese artists. Nineteenth-century caryatid stools adorned with glass beads reflect the culture’s emphasis on the female body. Contemporary art is well represented by Kenyan-born Magdalene Odundo’s unglazed ceramic vessels and Ghanaian El Anatsui’s enormous, shimmering wall installations made of aluminum and copper. Originating in the 1950s and still popular today, Ghanaian “fantasy coffins” celebrate the lives and livelihoods of the deceased. Elaborate caskets have been fashioned to look like airplanes, Coke bottles, and even cell phones.